Thanks to DNA testing, we now know that another Webb line is closely kin to our own. 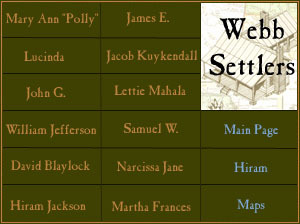 The descendants of Joseph Webb have been working on their family's history for some time now, and a test in May 2004 has revealed that Joseph and Hiram were somehow closely connected. The first place we can find either of them with assurance is in Lincoln County, Tennessee in the early years of the 19th century. Joseph was born around 1808, possibly in Tennessee. He is said to have lived in Lincoln County, but we also have records for him from Limestone and Madison Counties in Alabama (all three of these counties border each other). I am not sure where Joseph is located in the 1810 or 1820 census, but in the 1820 one, Hiram Webb is located in Lincoln County (the southern part of it). The borders at this time could be very confusing. In 1817, the map to the left (though fairly crude) gives an indication of these problems, showing Huntsville as being in Tennessee. If we have problems with this family moving around apparently at this time or maybe even being left off of a census, it's somewhat understandable. We might be better placing them in specific spots by towns or other things mentioned. Hiram Webb and David H. Blaylock were living on the Barren Fork of the Flint River in 1820, supposedly in southern Lincoln County, Tennessee. Though it's no longer called the Barren Fork, that waterway is now known as the Flint River itself (from Bloucher Fork maps used to say the Flint split into the Barren Fork to the NW and the Mountain Fork to the NE; the Mountain Fork still splits there, but the Flint continues up the old Barren Fork). In Tennessee, the Flint crosses over and drains Fowler Creek, Walker Creek, Slate Rock Branch, Williams Creek, and numerous other creeks. Certainly we can say that Joseph lived most of his life around this area, known as the Pea Ridge. Joseph's daughter Sarah Frances was married in Lincoln County in 1858 and was buried in the Blanche Cemetery, in Lincoln County in 1924. Blanche is located about three miles north of the state line. Joseph married by the time he was about 27. We don't know exactly when the marriage took place, but it was to Mariah Barbara Martin, a year his junior and from Kentucky. Her father was James Martin and her mother Sarah Wingfield. They had their first child we know of, John W. Webb, in 1835. On September 10, 1838, Joseph claimed land in Madison County, Alabama with the Land Grant Office at Huntsville. He bought half a quarter section of land, land which sits a little south of the town of Toney, in Madison County (about five or six miles northwest of Huntsville). In all his land covered eighty one and a half acres. Today, this land is just across the road, to the southwest of the Sparkman Middle School. On the other side (northeast) of the school interestingly enough, is Webb Pond. Joseph's land is drained by a little brook called "Dry Creek". This land is *not* drained by the Barren Fork of the Flint River, so this cannot be the same land (just across the state line) that Hiram lived on in Lincoln County. Joseph was thirty years old, with a wife a year younger than him, and a three year old son. Joseph and Mariah are said to have sold land in 1845 in Madison County, and this may be the same land he bought in 1838. The land is referenced in Madison County Book V, page 373, but I haven't found its exact location yet. (abstracted) James C. Watkins, agent of the Branch of the Bank of the State of Alabama at Decatur by a writ of fieri facia, issued out of the circuit court of Morgan County. 19th of May, 1843, to R.W. Anderson. Goods seized and sell to Joseph Webb for $3.95, being the highest bid. 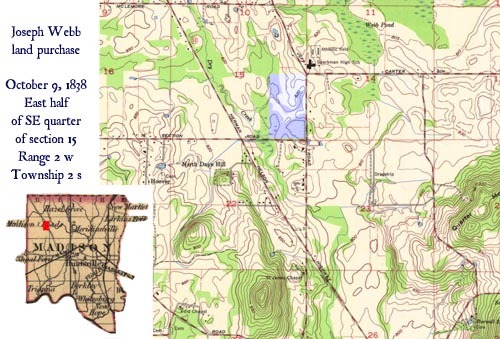 Land is the West half of the SW 1/4 of Section 4, Township 2, Range 2 West. This takes place on September 4, 1843. But it appears as though he sold this land in August of 1845, so he didn't hold it very long. It is unknown whether he lived on it or whether he stayed on his other property. We do know that Joseph bought a large tract of land (almost 500 acres) at Blanche, in Lincoln County, Tennessee, in late 1847, for $1205. 253 acres. This indenture made this first day of December in the year of Lord one thousand eight hundred and forty seven "between" Nimrod C. Golding of the State of Louisiana and Parish of Turborn of the one part and Joseph Webb of the County of Lincoln and State of Tennessee of the other part "Witnesseth" that the said Nimrod C. Golding for and in consideration of the sum of six hundred and five dollars, to him in hand paid, the receipt whereof he doth hereby acknowledge, hath bargained and sold, and by these presents doth bargin and sell alien, transfer, and convey unto him the said Joseph Webb his heirs and asigns forever a certain tract or parcel of land situate, lying, and being in said county of Lincoln, and State of Tennessee on the head waters of Kelly's Creek, a south branch of Elk River, containing by estimation two hundred and fifty three acres, be the same more or less, being a part of a tract of land originally granted to Andrew Boyd and John Hackett, beginnning at a black gum the south west corner of a tract now owned by Hannah Edding, running south one hundred and nine poles to a dogwood and Hickory, thence East three hundred and seventy one poles to a stake, thence north one hundred and fourteen poles to a fallen down poplar, the south east corner of a tract deedd to Wm. Edding Sr. by Ewel Shefs, thence west two hundred and four poles to the beginning. To have and to hold the aforesaid land, with all the appurtences to the same belonging or in any wise appertaining to the only proper use and behoof of him the said Joseph Webb his heirs and assigns forever, and the said Nimrod C. Golding for himself his heirs, Executor, and administrators doth covenant and agree to and with the said Joseph Webb he will warrant and forever defend against the right, title, claims or demand of all and every person or manner of persons whatsoever to the only proper use, interest and benefit of him the said Joseph Webb his heirs and assigns forever. In testimony whereof the said Nimrod C. Golding hath hereunto set his hand and applied his seal the day and year first above written. "in consideration of the sum of six hundred dollars" "on the head waters of Kelly's Creek" "Beginning at a Chestnut oak, running south forty D, East Seventy-seven and one half poles to a whiteoak, thence south fifteen D, East Seventy eight poles to a black oak, thece East one hundred and sixty seven poles to a double poplar dogwood, and hickory; thence north two hundred and thirty nine poles to two hickorys; thence south sixty five and a half D, West two hundred and sixty one poles to the beginning, containing two hundred and thirty eight acres, and ninety five poles"
In December of 1847, Joseph was said to have died in Madison County, approximately twenty miles from Blanche. He was only about 39 years old, and left a wife with three children ages 12, 8, and 3. This is one of the best single documents for tying this family together since we can easily see that the Webb children kept their last names and together with the marriage record from the year before, we know Mariah was a Webb widow who remarried to Mr. Philpot. Drury M. Perkins, adm. of Joseph Webb, paid Samuel Parks, guardian for John W., Joseph, and Sarah F. Webb, minors. Paid Wm. Filpot (Philpot) who intermarried with the widow of Joseph Webb. June 21, 1851. This document lists all minors, but I am curious as to the possibility that the older male not known from the 1840 census, might be an older son that either died or that we are unaware of (a son whose name might not have been listed in the 1851 documents if he was no long a minor). Growing up now in the same house, John married his stepsister Margaret in June of 1853 (they had lived together as teenage step-siblings for four years). Sarah Frances married a few years later, on December 8, 1858, in Lincoln County, to James Jasper McCann. And Joseph Jr. married on November 17, 1859, in Lincoln County, to Mary Smith McCann. In 1855, some of the land that Joseph had bought in 1847, was sold off by the children. Whereas by descent of Joseph Webb, deceased, we Joseph F. Webb, Sarah F. Webb, and myself, have arrived title to, and now hold an equal and undivided interest in a tract of land in the state of Tennessee, Lincoln County and district no. 17 and bounded as follows: on the East by Wm. Cole and Shassner (? ), on the South by Abraham Edding and Narri Leatherwood, on the west by the land formerly owned by Beards heirs and others and on the north by Richard Grasetting and my mother's dower, supposed to contain two hundred and seventy six acres be the same more or less. Now I have bargained and sold and do hereby transfer and convey all my right title and interest in and to said land to John C. Patterson and his heirs forever, for the sum of six hundred dollars to me paid. To have and to hold, the same to the said John C. Patterson his heirs and assigns forever, and covenant and agree for myself my heirs and representatives to warrant and defend the title to my undivided interest in said land against any claim to be made by one or any person. I do further warrant and agree that the said interest is unincumbered and I will warrant it against myself my heirs and assigns and all other persons whatever. Mariah lived a long life, finally passing away on May 29, 1898, in Lincoln County. She was buried at the Blanche Cemetery in the southern part of the county. Joseph and Mary lived a while in Lincoln County, but eventually moved to Hunt County, Texas.